Let's get one thing out of the way right off the bat here: not all of this is heavy metal. I'd say that the bulk of the second disc fits that category. Some of the first one does, and some of the rest (things like Michael Schenker Group and Rainbow) aren't far from it. That warrants putting this under heavy metal as far as I'm concerned. This is a career spanning anthology that's very cool. Not only do you get two full CDs of music, but there is also a DVD. That DVD includes performance clips (some music videos and some concert footage). 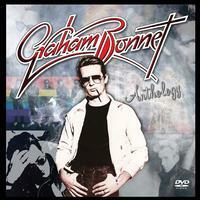 It also includes introductions for those clips by Graham Bonnet who comes across as very down to Earth and personable. I heartily recommend this set. It's got a lot of great material and is a good value. It should be noted that I previously reviewed all the Alcatrazz songs on their respective albums. 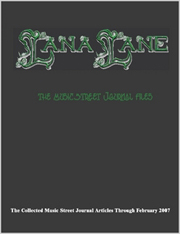 For the sake of consistency those reviews here were copied or modified from the original reviews. It should be noted that I previously reviewed all the Alcatrazz songs on their respective albums. For the sake of consistency those reviews here were copied or modified from the original reviews. This was written by the Bee Gees. This feels like a 1950s rock kind of thing. It's performed with a lot of falsetto. There are strings on the arrangement, too. I'm not a big fan of this thing. In some ways this reminds me of Rod Stewart. It's an odd little cut with something like talk box. The instrumental section calls to mind Paul McCartney just a bit. This time around Bonnet does disco. It's another song written by the Bee Gees. The funny thing is, this is actually pretty effective. In fact, I think I like this better than the two previous tunes. Now, this Rainbow song takes us into some killer hard rocking territory. This is a real winner for sure. This actually sounds a bit like Rainbow to me. Of course, that's without Blackmore's guitar. This is one of the stronger of the Bonnet solo cuts. It's a cool tune. A bit more on the pop rock side, the vocals are the real selling point of this cut. The instrumental part of this feels really dated to me. I dig the quirky non-lyrical vocal section, and the guitar solo rocks. This is harder rocking, but then again, it is Michael Schenker Group. It's a metallic rocker with a bit of a hook laden chorus. It's a solid tune. As you might guess, this has some killer guitar soloing. Progressive rock, hair metal and more merge on this cut. The vocals are pretty raw in their rock sound. In a lot of ways this really does feel like a cross between Rainbow and Yngwie Malmsteen’s solo stuff. One of my favorite cuts on its original album, this is a smoking hot hard rocker. I love the vocals on the cut. Then again, I love just about everything about this one. It’s again a bit like Deep Purple. I love the balance between the rocking and mellower stuff. Yngwie Malmsteen is the guitarist on this one. Another with Malmsteen, this is a live version of a song that Bonnet did with Rainbow. It is a classy jam. It’s the most mainstream thing on the original album from which it comes, though. This isn't a metal song at all. Instead it's more of an 80s rocker. There is a bit of a blues rock edge to the cut. It has some proggy things in it, too. Bonnet really shines on the harder rocking stuff later. I'm not crazy about the first half of the cut, but the later sections really work well. This one also features Vai's guitar. Another with Vai, epic metal, progressive rock and more merge here. This is very much along the lines of power metal, too. It's another killer tune. Melodic hard rock more in line with Rainbow, this is a classy tune. I dig the tasteful guitar solo on this. This is definitely more of a metal song. It's screaming hot. Mind you, it has a bit of an 80s metal element on the verses. That said, the choruses seem like the kind of thing that was an influence on European epic metal. I dig the guitar sound on this song. Another cut from sort of an 80s metal sound, this is one of the highlights of the whole set. I like this screamer a lot. It makes a good use of the contrast between more balladic and more rocking stuff. Yet, it never really drops to ballad form, just more dropped, less direct musical textures. The guitar solo is on fire. It's obvious that this is a demo from the sound quality. The song writing on it, though, is quite finished. This number has an interesting construction and manages to shine even in this raw form. This has a definite 80s metal sound to it. It's a killer tune that's catchy and meaty at the same time. While this cut has a lot in common with the last one (well, it is by the same act), this is more complex. It's less by-the-numbers. It's perhaps a bit less metallic, too. That said, there is still plenty of metal here. It's a strong cut. A new version of the Rainbow classic, this is strong. I prefer the original, but you really can't complain about this. Somehow this version makes me think of Kiss a bit. This is much more of an adult contemporary kind of cut. There are hints of the jazzy kind of arrangements that were so common in the 1980. This is a solid mellow tune, but it's a bit lightweight and dated. Now, this is more like it. Here we get some screaming hot real steel. This is one of my favorites here. As this comes in, it makes me think of AC/DC. It works out more metallic than that. It's another killer metal tune. Literally a screamer, this is a full on heavy metal assault. It really rocks. This is a bit more of a straight-ahead rocker than some of the other Bonnet solo cuts. I like this quite a bit. It isn't metal, but it's definitely rock and roll. Another that's fairly strong, this is more of an AOR rocker in a lot of ways. It does get a bit more metallic in some of the rocking sections. I love the main riff that drives that part. It makes me think of Aerosmith a bit. Comparisons to Queensryche are valid at points on this tune, too. Take no prisoners metal, this is another screamer. It's perhaps a bit less nuanced than the last number. It makes up for that with sheer force. Fast paced and fiery, this is another killer metal stomper. It's almost in the middle ground between the last two cuts. It's a bit more hook laden and complex than "Hunting Time," but is much more furious than "Killer." I love the killer guitar solo. More mainstream metal, this works well. The chorus section is more along the lines of AOR rock. Even meaner, this is another metal screamer. I love the expressive guitar work on this cut. It's a powerful tune that is melodic, but yet metallic at the same time. While not a huge change from the last song, this is just as potent as the other one. It's a great number, really. You couldn't tell this was a demo if they didn't label it as such. This is a great hard rocking number that feels quite metallic. It's actually one of the better tunes here. There is a lot of screaming metal built into this beast, too. It's another scorcher, but not a huge change. This starts a bit mellower, but powers out into some screaming heavy metal from there. While a big chunk of this is heavy metal based, there are some more straight rock and roll things here, too. There even a couple bits that remind me of Alice Cooper just a bit.